Leak Test Apparatus – 1961 | Electronics India - Manufacturer, Supplier and Exporter of Analytical, Scientific Laboratory and Pharmaceautical Instruments in India. Leak Test Apparatus is a solid state instrument designed for the leakage testing of food, drug and other industrial chemical products. The instrument is used to test the quality of packing processes in strips, blisters and sachets containing tablets, granulates and liquids. They are also used to check that the seals enclosing the product are perfectly intact. The unit contains a polycarbonate desiccator housing to sustain the vacuum for long time. A compact vacuum pump for creating high vacuum level in short time period is used. Test samples to be analyzed are placed into the polycarbonate desiccator housing. 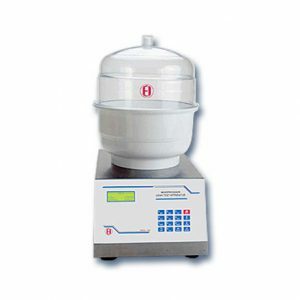 A vacuum pump generates vacuum inside the desiccator. The vacuum generated is held for a pre-set time, and then released. The test samples being analyzed should retain their shape during this test, indicating the sealing is correct. Secondly the strip/bottles under test are immersed in a colored dye solution (normally Methylene Blue). The venting of the desiccators will allow any holes to be penetrated by the dye and the contents of the flexible packaging will also be stained with the same coloring material.